Wall to wall carpet is slowly disappearing from homes and I am very happy. Smelly, unhygienic wall to wall carpet has never been one of my favorite items for home décor. I have seen horrific carpeted bathrooms and laundry rooms or foyer that made me cringe every time. I am glad all of that nonsense is going away. My title asks a question stones or rugs, referring to a floor of any room. This is not a hard choice, as people know what they like most of the time. If it was up to me, I would never ever propose area rugs, and wall to wall carpet. The dust and germs under the shoes brought in the house from the street, or even the dead skin under bare feet, are two sufficient facts to decide against it and yet people still ask for carpet and rugs. The health of a room depends much on the cleanability of each item to avoid dust mites from making their nest everywhere and create allergies. Stones or rugs are two different looks with two different textures. 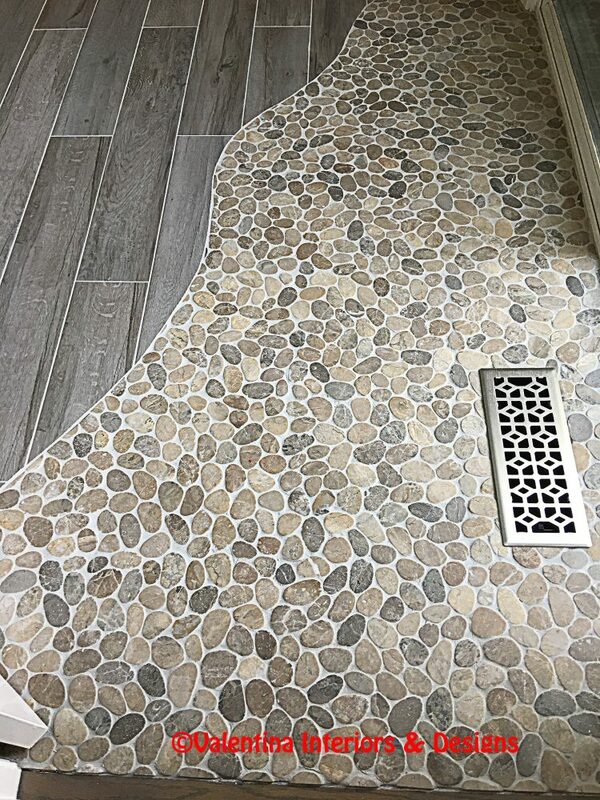 A stone floor is washable with soap and water, stays clean and fresh, keeps the room cool in the summer heat and lasts forever. One way to muffle the echo when a room is large like a salon or a cave is to decorate it with upholstered furniture, pillows, throws, wallpaper and a lot of wood accessories. A large room carpeted from wall to wall is just a larger opportunities for dust mites to reproduce and multiply. A colder climate area would be the exception to my rules and I would opt for a rug, but not a carpet. I would place an area rug only in strategic places such as bedrooms, living rooms, or home office, just to add some warmth to the room. New Waves rug – Hand tufted, 100% Chinese wool with a beautiful sheen that brings a bit of light on a grey floor. 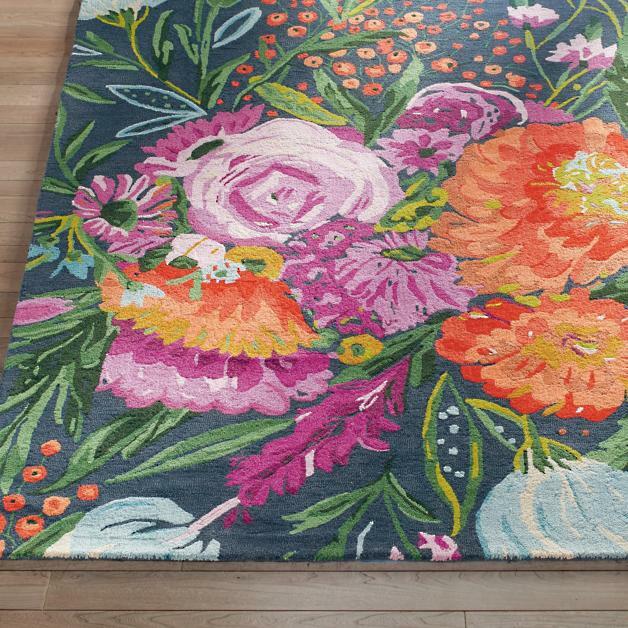 Heather rug – The description says: dramatic, vibrant, “pretty-but-edgy” floral design. Large flowers are all the rage today, on wallpapers and on rugs, don’t be afraid of looking at bold flowers, after a while the eyes get accustomed and space becomes joyful. 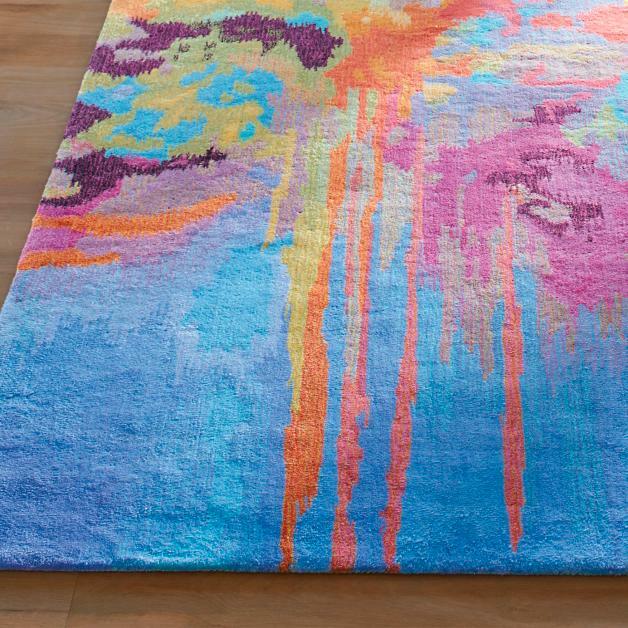 Jules rug – Colorful abstract puts art on the floor. 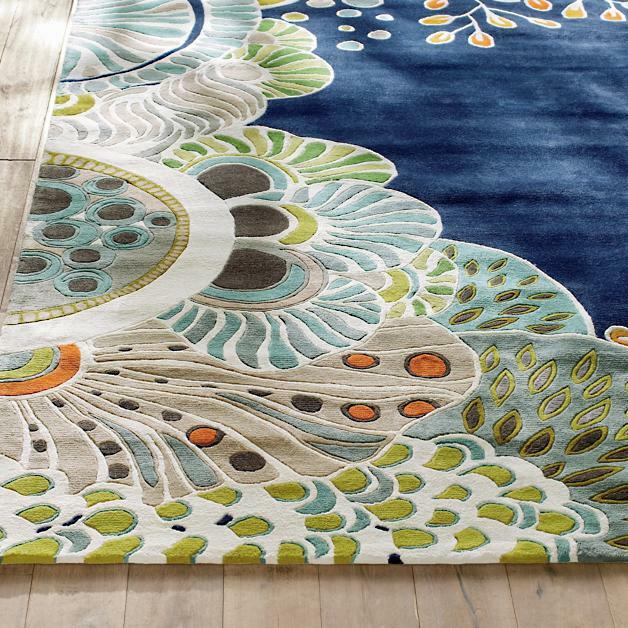 Ellis – Traditional rug design fits anywhere, even in a modern setting. My question, however, is a different one. If the floor is created new, it is original and outside the box, made interesting to look at, the room is small (I doubt the stone floor creates an echo in a small room), what is the reason to cover it with a rug? This is the new floor I created for a guest room in a client’s home. It’s made of distressed wood and sinuous shaped marble pebbles by the French door leading to the garden. My preference would be to leave the floor naked as part of the furniture, my client prefers to have a rug and those above are my choices of a rug. If we must cover a new floor, let’s do it with colors. Valentina Cirasola transforms and creates spaces realizing people’s dreams in homes, offices, interiors, and exteriors. She infuses your everyday living with a certain luxury without taking away a comfortable living. Valentina is well-known for bringing originality on any project and for thinking outside the box. Her interiors are not made with cookie cutters, only follow client’s inspiration, lifestyle, and personality. 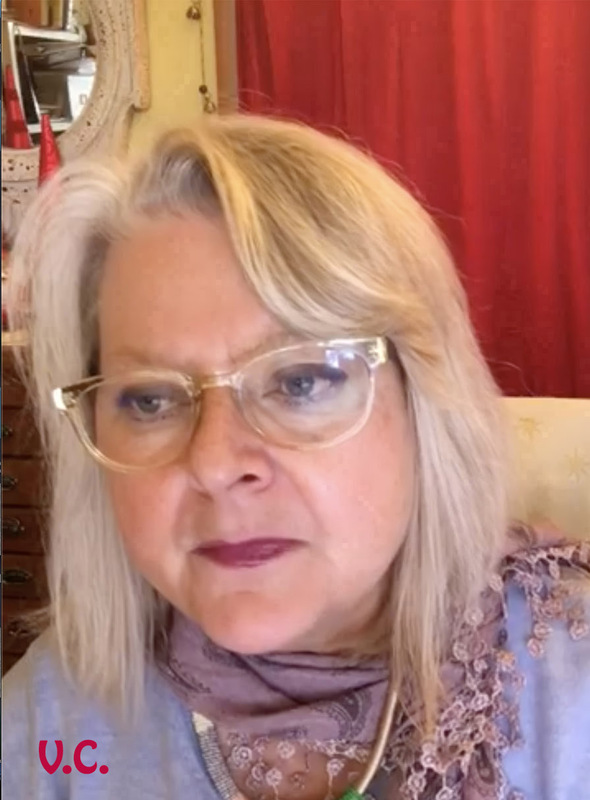 She offers online design consultations through Skype or Zoom and the traditional in-house consultations, helping people with their design challenge anywhere in the world. She is the author of four books. What beautiful ways to dress a floor, Valentina. I do love the stone floor. I wouldn’t want to cover it either. The colors in the Heather rug are gorgeous. Even though (at least right now) I’m enjoying purple-orange-yellow combinations, I really love the designs in the New Wave rug. Such lovely choices. Have a wonderful weekend. Hugs! Teagan, this guest room I am finishing to design is a small room located in the center of the house, no walls are exposed to the exteriors, thus is very warm, I didn’t see the need for any rugs covering the beautiful floor, but the clients wants a rug and she will have it. Thanks for taking the time to comment.